One of the great things about homemade vegan food is that it's often both pleasing to the eye and to the tastebuds! I discovered this recipe right before Christmas (as part of the Green Christmas Menu) and decided to make a full vegan/vegetarian (one dish contained eggs) Christmas day dinner. It was a big success! My favourite dish was the most simple one and also the most colourful one: a very purple cabbage salad. Made with only 4 "base" ingredients, it's a salad you can make in under 5 minutes. Very easy and super delicious! All this recipe requires is some slicing and basically putting some ingredients together. 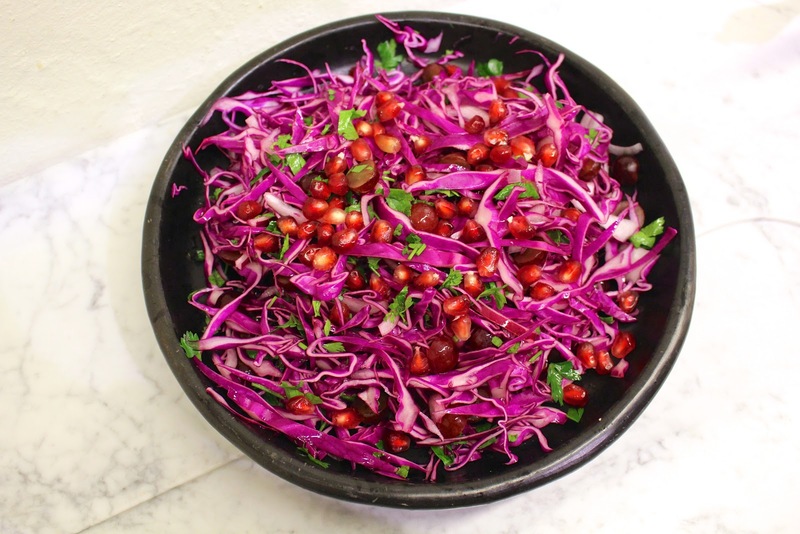 You'll be amazed at the flavour of this salad: sweet, crunchy & sharp! Slice half a red cabbage and red onion very thinly (I'm not so good at that but I tried my best.. I usually leave this job over to my mom, she's an expert!). Cut the grapes in half. Chop up the parsley coarsely. 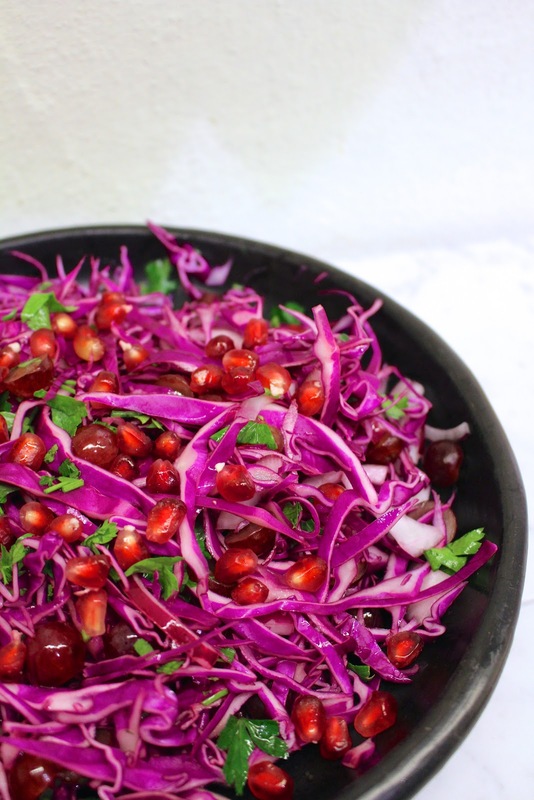 Add some pomegranate seeds for extra crunch & sweetness (but you can also skip these). Put everything in a bowl, pour over the dressing and mix it up. Now serve as a side with your meal, the perfect colourful addition to any vegan lunch or dinner. If you want to have this as a lunch, add things like avocado, lentils, tofu, tempeh, red quinoa, nuts and seeds to make it meal-worthy. This salad is so easy, delicious and a feast for the eye; I think it's my new favourite (thank you GK Stories)! I've made it like 5 times already now :) Now it's your turn. Let me know what you think!